I am thrilled that he agreed to share his bullet journal with you today – because he’s awesome, funny, and his style is super functional and aesthetic in its simplicity, similar to the original system. Get it, Austin! In this transition period, I’ve come to several weird realizations: I am no longer a student. I do not know what I’m doing in general. And thanks to all the changes, I have no idea how to use my bullet journal anymore. Being a student was easy. My semester was planned out thanks to the syllabus. I took the tasks outlined in the syllabus, stuck them into an itemized collection in my journal, transferred those items to a daily page so I’d actually do said tasks (though this generally happened after the task was due—sorry professors), and hoped I got a decent-ish grade. Two months post-graduation and my life involves an 8-5, a lot of Netflix, and so much Chick-Fil-A that three different cashiers know my name and full order (before you judge, cooking for one is really hard and obnoxious, and I live 1 minute and 54 seconds away from Chick-Fil-A). Work tasks generally involve repetitive items like “respond to email” and “check breakroom for donuts.” Since I really haven’t taken the time to figure out how my journal fits into my new life, my journal has gone unused… for like a month. I think we’ve all been there—good planning intentions fall by the wayside in light of a new season of Orange is the New Black on Netflix. Unfortunately, my life goes down the drain when I don’t plan, and I forget to do things like respond to personal email and write guest blog posts, so the past week I decided to take some of my own advice. I admitted that I was currently sucking at planning and decided to reevaluate my journal completely. Sometimes you just need a complete and total reset. Today I forced myself to use my journal throughout my whole day. Tomorrow I’m setting aside some time to figure out how I want to track expenses, and the next day I’ll work on the next point until I figure out how to fulfill each function with my journal. Sometimes it’s okay to lose it and publicly admit to it. Who knows, maybe some of you feel the same way about your journal and need a reset too. I want to know—ever had a journaling crisis or got stuck in a rut? What did you do about it? Austin Miller is a photographer, coffee lover, NPR addict, and recently-graduated “young professional” (he doesn’t know what that means either). Desk job worker by day, Instagrammer by slightly later in the day (have to catch that perfect evening light), Miller shares his bullet journal (mis)adventures at @minimaljournal and his personal life at @amillerphoto. Becoming an adult was a bit of a shock, wasn’t it? Very enjoyable piece. Adulting is definitely a shock! Yes! Exactly! Although I can’t say I remember it that well lol. I’m in the middle of a journaling / planning crisis right now. Kind of hanged – searching for a job, having no idea what to do with my blog and my business plans, so my bullet journal was also left out. Totally get that. I’ve thought about getting a new notebook myself and designing it around work. It’s hard to know what to do in the middle of so much transition! Perhaps you’ll start in August 🙂 Maybe your bullet journal can be a good place to do a mind map of all the things you’re thinking of, to make sense of where you want to go next? I think the past two months I’ve only done two weeks of dailies, about half a month’s worth of expense tracking, and less than that of habit tracking. I really want to get back on track, but feel so bogged down with the long to-do list in my head due to adult life and taking a summer class and working full time and studying for the CPA and taking care of my dog and cat that I feel like if I try to sit down and jot things down the fact that I’m NOT doing everything almost makes it worse. Even though I know it would totally make me feel better. Sigh. All in due time, I suppose. Welcome to adulthood! Understandable – there seems to be a neverending list of things we could be doing. Plus, try not to let the gaps in your bullet journal get to you – take a break when it calls to you and it will be waiting for you to start whenever you return to it – especially if you are focused on that crazy CPA test!! The beauty of a bullet journal is that if you have it written down, you don’t have to give it space in your brain. If all you were tracking was your classwork, you’ve only barely scratched the surface. From someone long on the other side of becoming an adult (my son just turned 30 LOL), may I offer a couple pieces of advice. First of all, – everyone, no matter their age, has to take care of (or help take care of) their physical environment. So start out with your house/apartment. Figure out what chores have to be done to keep your place as tidy and clean as you like to have it and laundry under control. Schedule those on a daily or weekly basis. Second – you need to keep up on your appointments. Use a future log or classic calendar to keep track of holidays, doctors and dentist appointments ect. Do you belong to any clubs, professional groups, worship/faith groups? Gym or sporting events? Migrate those to your daily or weekly spread so you won’t loose track of them (or schedule two things at the same time). Third – finances and legal stuff. You need to have a budget/spending plan. It’s no fun to have more month than money. And you should have a will, and the other legal documents like a power of attorney and health care directive. While not a journal thing, it’s an adult thing. Do it. And register to vote! Lastly, just because you have graduated, you shouldn’t stop learning. Take a class to keep your professional credentials fresh, take a class just for fun. Learn a new hobby or a new language. Getting out on your own as an adult is not easy. And maybe your life is such that you can keep track of everything with just your brain, no journal needed. But trust me, it will get more complicated as you go. And if you get into excellent habits now in regards to your time, your finances, your household, it will pay off big time as you get deeper into adulthood. Thanks for stopping by Caitlin!! I feel the same right now with all the things I need to do to prep to teach this semester… so many little updates and tedium! Loved this, Austin! I didn’t have as much of a shock as you did — or maybe it just hasn’t hit me yet! 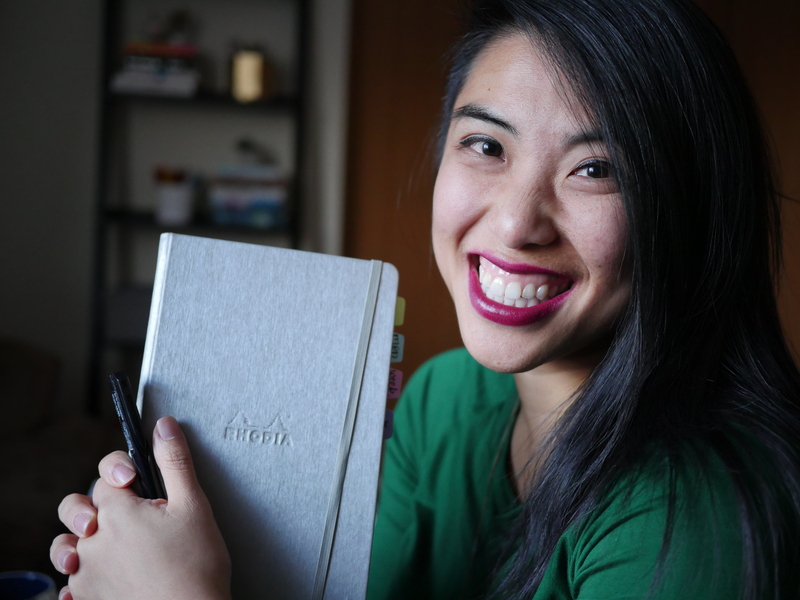 I started bullet journaling when I was an intern though, and continued as I finished college, which included a final semester where I juggled college AND tutoring 5-6 different students at once. Then I transitioned to now, where I’m tutoring and doing the blog stuff for fun — though it does take a lot of time! So maybe my transitions weren’t as extreme! I think the worst part was the housekeeping and budgeting. In college, I’d mop the floor every week. At home, I fell into bad habits of not doing it for weeks so quickly. And budgeting is *hard*, especially no spends! I haven’t joined the corporate world yet — I’m not keen on it but I probably will later this year — but I anticipate a planning crisis when that happens! It always does when your life starts moving about! Wait, how do you have access to Chic-Fil-A AND a pile of Canadian pocket change casually lying around?! Have you ever been so angry the way your life is going so much that you literally toss your current bullet journal in the trash so you can start a fresh different one?